Indexing is performed via duc index <path> and seems very quick when compared to something like du -sh. The index is stored in a local database. I adopted duc in sad circumstances after the prior maintainer decided to step down, in response to a discussion we had about a feature request for the Debian package. This wasn't the outcome I wanted, but it's a package I use regularly on several machines so I stepped up to adopt it. Oooh, interesting. I do love Filelight, but this seems more viable for running on various servers that lack GUIs themselves. The circular view seems good to identify big directories. 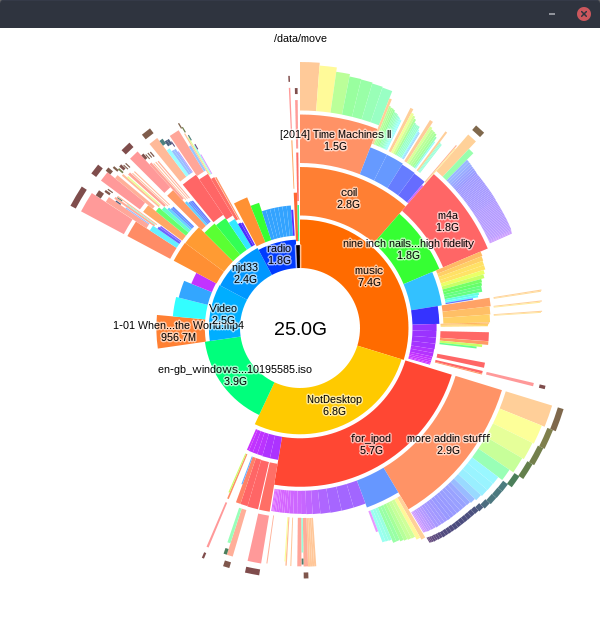 To find big files, I prefer the Treemap visualization qdirstat/k4dirstat/windirstat. Do you use it as well?